Bloodshot Bill is bonkers. If you happened to be at his show at the Horseshoe, you would wholeheartedly agree. Seeing Bloodshot live is akin to witnessing an exorcism. In 1950s-style silk pinstripe pajamas and a navy blue housecoat, hair expertly pomaded and slicked back to brilliantine perfection, Bloodshot Bill goes in for the kill. He is simply possessed: howling, crooning, screaming, grunting, yelping, snorting, moaning and groaning into the microphone. Vocal acrobatics like no other, going from shrill squeals to deep tones in seconds. His bare left foot keeps the cymbal crashing; his right is kept busy beating the bass drum. A hand-drawn crest of “BB” duct taped to his bass drum ups the primitive and raw ante. 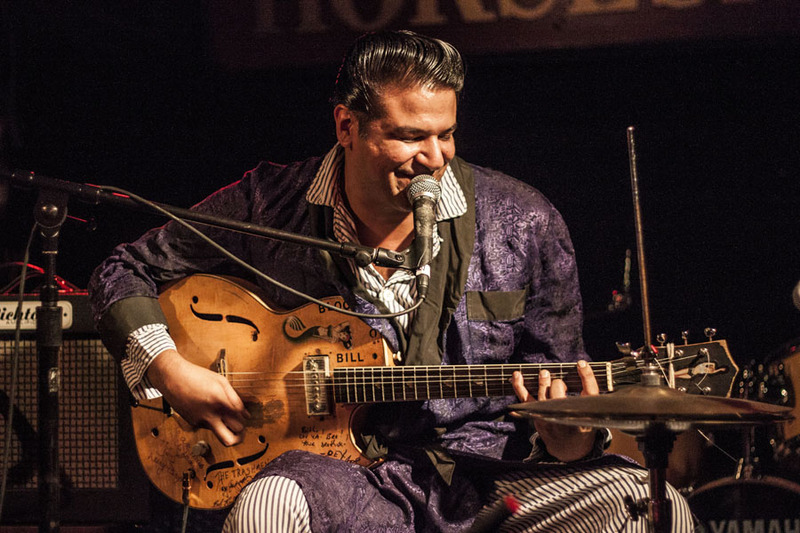 His hollow-body guitar (charmingly labeled with ‘Bloodsho Bill’ – the ‘t’ undoubtedly worn off during one of his rowdy sets) rounds out the one-man show mix, and with it he delivers a seemingly endless rockabilly spew. Offering not a moment’s rest between tunes, Bloodshot Bill powers through his set, shaking his head back and forth making a mess of his expert ‘do. It’s chaotic, raunchy, and undeniably satisfying. Bloodshot brought the same energy displayed at his Silver Dollar show back in March. His rogue firecracker disposition appealed to everyone in the crowd, or at the very least, it was enough to have every toe tapping and head shaking. At times incomprehensible (as far as words go), but all the while delivering deliciously delirious sounds that confuse and amuse everyone in the room. You’re in for a thrill with Bloodshot Bill. The Montreal native (who has his own brand of custom made hair grease, Nice N’ Greasy), is a man of minimal stage banter, but that comes as no surprise with a set like his. Just over an hour of songs with titles like, “Can’t Dance Alone,” “Crazy ‘Bout The Girl,” and “Stop!” (which had the crowd shouting “stop” in Bill’s direction to round out the chorus, of course, as no one actually wanted him to quit dishing out the goods), there simply is no time for idle prattle. The highlight of the show? After a goofball stage dived into the crowd (which cleared out of the way, having him land spot on the floor), strewing ice cubes and broken beer bottles on the stage, Bill remarked, “I thought this was an ice cube near my foot, but there’s broken glass up here. Looks like a jewelry robbery.” Classic. The next time word of one-man wonder Bloodshot coming to town (barreling down the highway, no doubt) reaches your ear, don’t hesitate to take that night off. It’ll be a treat, I promise.